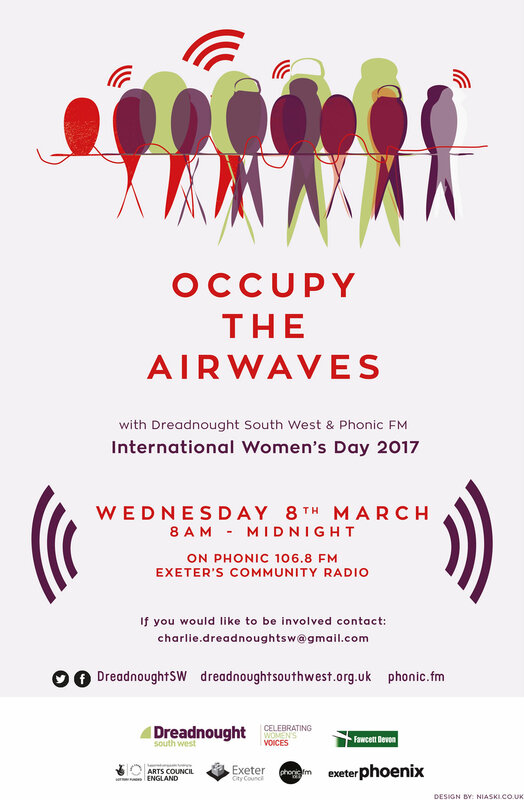 In collaboration with Phonic FM, Exeter’s Community Radio, we were delighted to producing 16 hours of radio programming on Wednesday 8th March, to celebrate International Women’s Day 2017. We were also celebrating the great diversity of women and girls voices from across the city of Exeter with a wide range of subject matter. See the Schedule page to read more about this and who was involved. Dreadnought South West built the programme of 16 hours in response to everyone who had shown an interest in being involved either by coming to a meeting, or by contacting us. We were thrilled to have so many of the women involved in last year’s pilot Occupy the Airwaves getting involved once again. Over 50 women and girls voices were heard on the day. Thanks to everyone who volunteered their time to be part of this day, and to all of you who visited us in the ‘green room’ at Exeter Phoenix, to say “hello” and to listen in as we had the broadcast live all day from there. A big thank you to Exeter Phoenix for their support of the project, including the Cafe Bar staff who ensured we always had tea and coffee to offer our guests. It really contributed to the day feel like a community was gathering thanks to this space. To the programme hosts and to those who drove the desks. To everyone who was interviewed. Thanks to Sam Smethers Chief Executive of the Fawcett Society who was interviewed especially for the programme on Women and Activism, and to Fawcett Devon for enable this to happen. Thanks to our Trustees who always inspire us and who contributed to shows and through their support in the background. To John Wigzall, Pat Bensberg and Dave Treharne from Phonic.FM who all supported the project. To ALL the Phonic DJs who gave up their regular slot on the day to enable this occupation to happen. To Belinda Dillon for the Podcasts and her support. To Rod Barnes for the CDs. Finally; a massive thank you to everyone who was listening and to those who also beamed in via social media to let us know that they were listening in. Our Twitter feed was very busy all day. This event was supported by Arts Council England South West, Phonic FM, Exeter Phoenix, Exeter City Council and Fawcett Devon. Thanks to you all. We will let you know when we are able to add the programmes to the website to allow you to listen in again, or to recommend to friends, for those who couldn’t listen in the first time around. Josie, Charlie, Natalie & Kerrie.